Learn how to get exactly what you want out of your next negotiation. How many times have you given in on something that’s important to you just to get a contract signed? There’s a better way to use negotiation to avoid disappointing sacrifices. There is no such thing as a “win-win” compromise. Negotiating for effective solutions means looking at the agreement long term, not just your immediate goal of closing a deal. 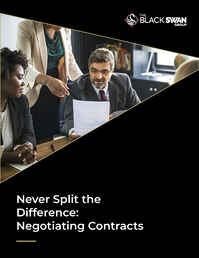 Learning how to establish trust in negotiations, while keeping your own goals in mind, will help you get that signature on the dotted line without any buyer’s remorse. Download our seven-step e-book to learn how.